For folks wanting to enjoy a peaceful, quiet, traditional neighborhood, the North Shoal Creek neighborhood is a great find. The area is ‘convenient to everything’ as many who live in the neighborhood say. Whether you need to get to the grocery store, the school, or the post office: North Shoal Creek is up-and-coming. This is not a ‘trendy’ neighborhood, but the type of place where you move in, meet your neighbors, and enjoy the Austin culture. Whether you are looking for yoga, acupuncture, or a gluten free bakery, North Shoal Creek has everything within a short distance. This is a great spot for families seeking a suburban lifestyle close to work. Located between Mopac and Highway 183, this small neighborhood is bordered on the south by Anderson Lane and on the east by Burnet Road. Most of the residents own their home and are higher-income urban-suburbanites that participate in the all-volunteer neighborhood association whose purpose is to promote and protect the quality of life in the neighborhood. 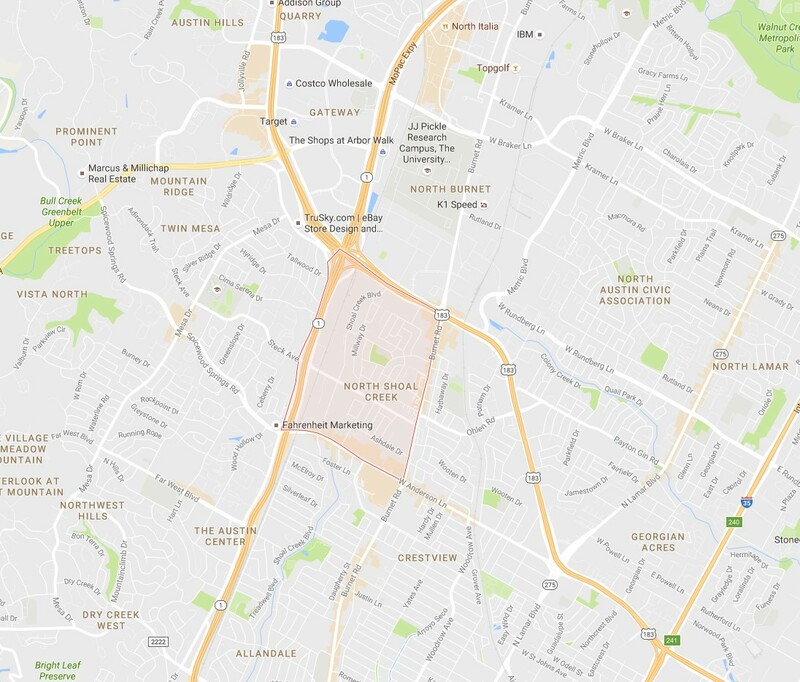 We could list the multiple restaurants available, but the wonderfully traditional North Village Branch of the Austin Public Library System is within the North Shoal Creek Neighborhood. This library is a great resource for children and adults not only for access to books, but for events and meetings. If you need a quiet space to meet or do work, there are plenty of desks and couches with easy parking. There are writing workshops, computer instruction, adult coloring and coffee time, and of course…storytime! There’s a lot to do within the library!